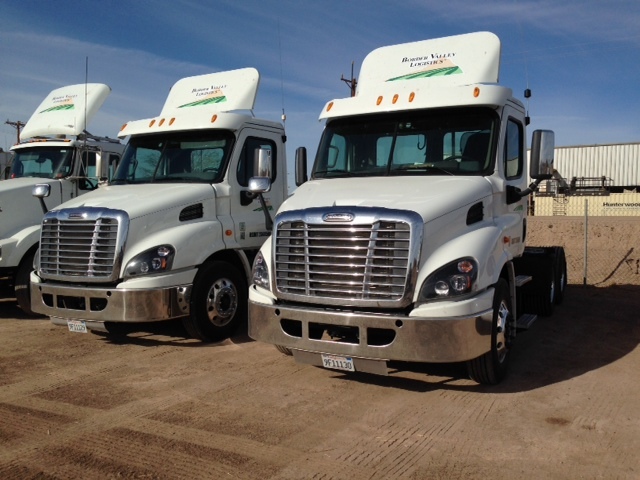 Border Valley Trading recently expanded their liquefied natural gas (LNG) fleet by adding 8 new tractors to their Brawley location. BVT deployed the Freightliner Cascadia equipped with the Cummins ISX 12-G Nat Gas Engine. 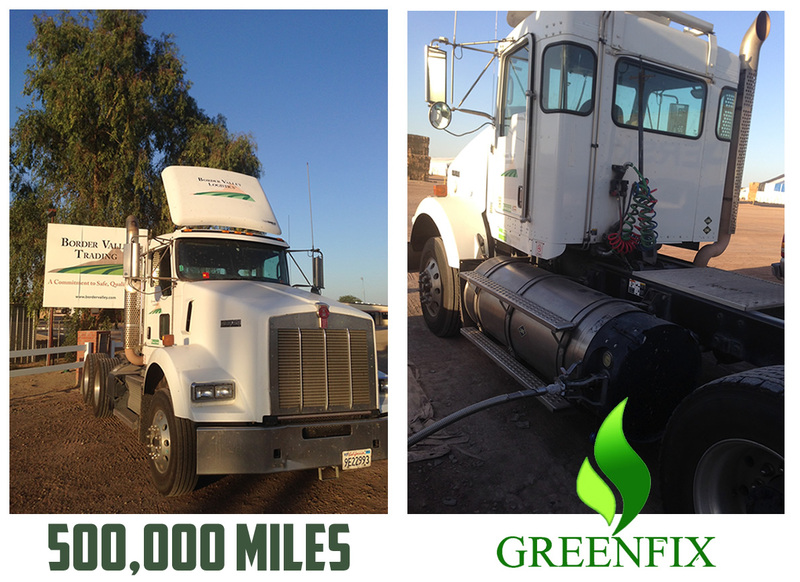 New fueling equipment was also deployed using the Greenfix mobile LCNG fueling platform. BVT currently owns and operates 27 LNG powered units and looks forward to an additional expansion of 10 - ISX 12-G units for the Turlock operation later this year. Mesquite Cattle Feeders and Border Valley Trading - Turlock solar projects are helping to reduce GHG emissions by close to 800 tons/year. Border Valley’s proposed 2013 solar project for Brawley operations will help reduce GHG emissions by an additional 600 tons/year. Border Valley’s 2007 fleet conversion from diesel to Nat Gas in 2007 continues to reduce GHG emissions by over 1,000 tons/year. Mesquite Cattle Feeders recent boiler conversion from diesel to Nat Gas is helping to reduce GHG emissions by close to 350 tons/year. Border Valley’s proposed LNG fleet expansion in Q4 of 2013 will help reduce GHG emissions by close to 400 tons/year (versus diesel trucks). Through a collective effort to help the environment, Border Valley and Mesquite Cattle Feeders hope to reduce GHG emissions by +3,000 tons/year by 2013 year-end. The annual GHG benefit from the combined projects would be similar to removing a 1000 small cars that drive close to 10,000,000 miles/year. Border Valley Trading is pleased to announce the recent install of a Hunterwood Technologies FC10000 forage compactor at our Brawley plant. 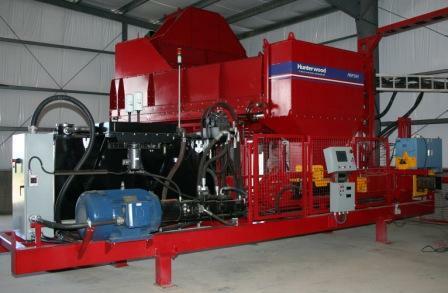 The FC10000 is Hunterwood’s flagship press and will allow us to produce half-cuts, whole bales and jumbo MAG bales. The FC10000 was officially handed over to us on February 7 after an Acceptance Test was performed with members of the Hunterwood team. With our Hunterwood press, we anticipate we will fulfill and exceed our customer’s expectations. With the recent install, we are now able to enhance our BVT Edge and continually deliver the highest quality forage products. We appreciate everyone’s help and work to see this project through. A special thanks to Hunterwood Technologies for supplying our press within our timeframe and their continual support. Sudan acres in Imperial Valley as of June 13th was 57,576 acres, which is almost the same as last season at this time. Farmers continue to plant sudan and we anticipate total sudan acres in the Imperial Valley to be about 65,000 acres. Farmers in the Imperial Valley are busy planting and harvesting sudan grass. Sudan acres as of June 3rd were 52,445 acres. In 3 weeks, farmers planted an additional 13,819 acres after harvesting wheat. It now appears total acres in the Imperial Valley will be close to last year’s July peak acres of 64,607. Also, we expect less domestic demand this year due to declining alfalfa prices and feel there will be plenty of sudan supplies to meet export demand.